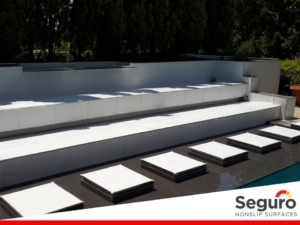 A water feature at a luxurious home in Atholl is made safer for children to run and play on. Homeowners are often torn between designing their dream home with the finest finishes and keeping their home safe for family and friends to enjoy. When it’s hot we all love taking a dip and lounging around the pool. Kids playing and the braai warming up. It’s summertime in the sun South African style! But what if your pool is not a safe playground for your children? A concerned father in Atholl contacted us to address a very dangerous and slippery water feature that forms part of the pool area. His children love running and playing on the steps which are always wet and very slippery. 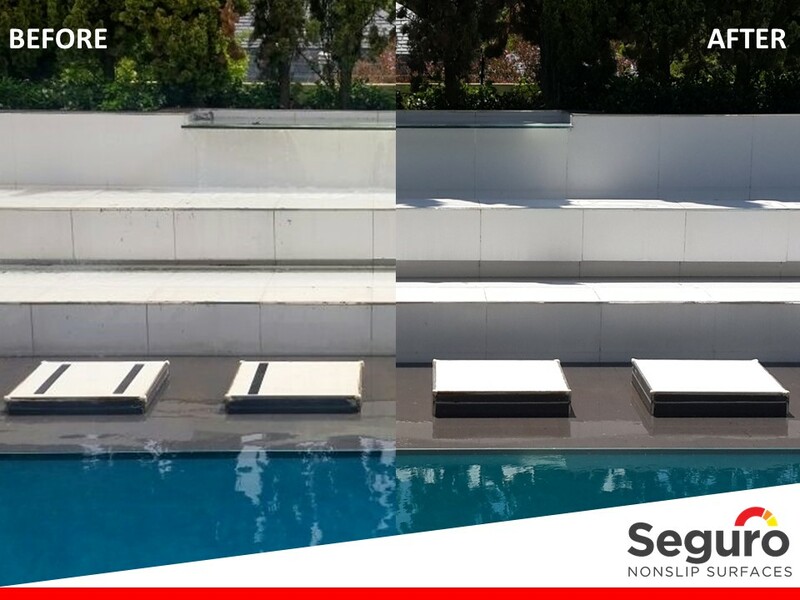 He had resorted to sticking black anti-slip tape on the beautiful white porcelain tiles but this was not solving the problem and it was spoiling the attractiveness of the pool. We recommended our anti-slip coating. With the coating on the tiles he didn’t need the ugly tape anymore and the feature would be safer to play on and a lot more attractive to look at. We also cleaned the tiles and restored the feature to it’s former beautiful self. There are instances where anti-slip tape works, especially on stairs and ramps, but on a beautiful feature as this one and with the safety of the children at stake, the anti-slip coating was the best option to add adequate slip-resistance to the tiles.